Seiko JW-28BL extra heavy duty twin needle lockstitch industrial sewing machine with bottom feed, needle feed, walking foot top feed and extra large capacity vertical sewing hooks for use with heavy weight or bulky fabrics. 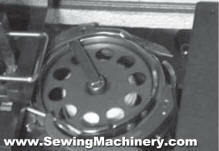 The JW-28BL-30 model features an extra long arm clearance from the right of the needle of approximately 30" (762mm) and are used when a standard arm machine is not big enough. Also available JW-28BL-20 with 20" clearance and JW-28BL-10 with 10" clearance. Suitable for twin needle sewing on heavy and extra-heavy material such as canvas, leather, vinyl, upholstery fabrics, tents, awning, tarpaulins, lorry curtain siding, covers etc.